Every season when it is time for the green beans to be ready, I get pretty excited because I challenge myself to create a new recipe. So, this week when the young beans were ready, I decided to use my favorite method of cooking the beans, which is to stir fry and then finish in the oven to caramelize. This time I added garlic, tomatoes and fresh oregano before putting them in the oven. When the beans were cooked tender, I finished them with a new twist by adding feta cheese that has sun-dried tomatoes and basil mixed in. It was a good decision because the beans were really good, and my husband who does not like green beans, ate two servings. 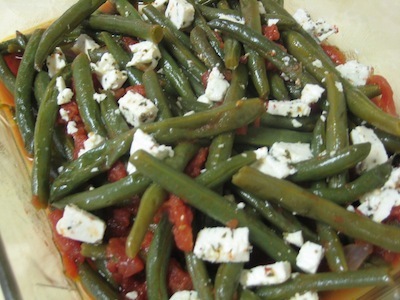 The green beans would be an ideal side dish to serve with Greek chicken and roasted potatoes that have been doused with a little lemon juice. If company is coming for dinner, add a salad of lettuce, with olives, and sliced red onions and a Greek style vinaigrette. Add some rustic country bread, and some fresh fruit for dessert. You’ve got it made. I have given the roasted potato recipe that I use below. For the chicken recipe, I just use a chicken cut into pieces and pour on a mixture of fresh olive oil, paprika, and lemon and cook the chicken until the juices run clear. That is how I do it. If you like, you can always mix olive oil and Greek seasoning and pout that over the chicken. That is a good combination also. You can buy Greek seasoning on the spice aisle of your favorite grocery store. Add the olive oil to a heavy skillet set over medium high heat. When the oil is hot, add the green beans and stir fry until the beans begin to caramelize, and stir fry about 4 minutes, and then add garlic and stir fry another minute. Add salt and pepper to taste. Add the oregano and tomatoes. Cover the skillet and place in a pre-heated 350ºF. oven and bake for approximately 25 minutes* or until the beans are tender to your liking. Remove the beans from the oven, and check for seasoning, add as needed. Add the feta cheese in either crumbles or cubes. Serve immediately. Serves 4. *I like my green beans very tender so I cooked them an extra 10 minutes, but check them at 25 minutes, or less depending on your preference. Heat the oven to 475º. Place quartered potatoes in a single layer in a heavy metal baking pan. Add the ½ cup water, olive oil, lemon juice, oregano if using, salt and pepper. Toss potatoes until well coated. Bake uncovered until tender and starting to brown around the edges. Turn potatoes half way through cooking. Serve the potatoes on a platter with lemon wedges and fresh oregano sprigs. Serves 4.